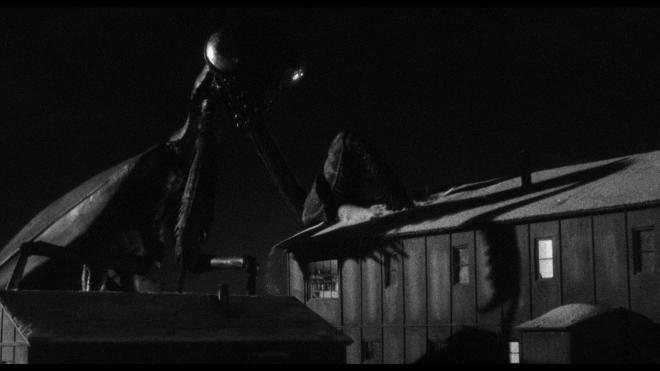 Big bug B-movie schlock doesn't get much better - or worse - than Nathan Juran's 1957 classic The Deadly Mantis! Made on the cheap by Universal International with miles of stock footage, this flick hits all the best bug movie tropes and is amazingly entertaining even when it's stretching its premise entirely too thin. Scream Factory delivers a first-rate Blu-ray complete with new 2K image scan, a great audio mix, and a fine assortment of bonus features including the classic MST3k episode! Recommended. "In all the kingdom of the living, there is no more deadly or voracious creature than the Praying Mantis." 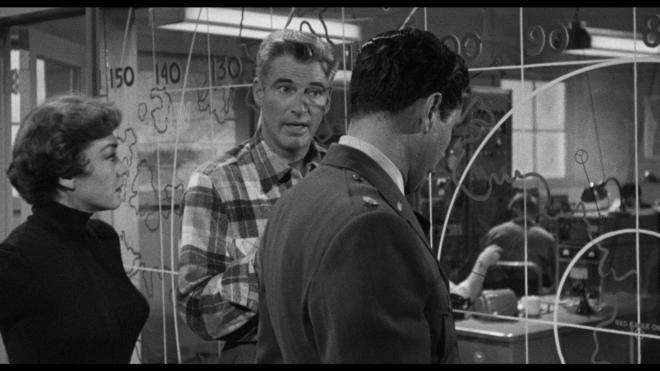 After a volcanic eruption causes a break in arctic ice, a gigantic dormant monster Praying Mantis is unleashed to wreak havoc upon the U.S.'s early warning radar stations! As the massive bug moves south destroying cities and eating people - Air Force Colonel Joe Parkman (Craig Stevens), Pentagon Brass Major General Mark Ford (Donald Randolph), paleontologist Dr. Nedrick Jackson (William Hopper) and his photographer Margie Blaine (Alix Talton) must come up with a way to kill the most deadly creature the planet has ever seen! Universal International was the premier genre arm of Universal Studios responsible for a number of hit Sci-fi and Horror classics throughout the 50s. Unfortunately, as competition for genre films increased, costs ran up and the powers that be decided stock footage was the way to keep costs in check. A practice that was used to pad out The Mole People came to a head with The Deadly Mantis. There's so much stock footage used here that you could practically make a drinking game out of how many consecutive minutes were used. But that's all part of the charm! When your movie's first five minutes is literally a camera panning and zooming around a map of the world and cutting to stock footage - you know you're in for a ride! Thankfully once the show gets going it's a hell of a lot of fun. I really enjoyed how a movie called The Deadly Mantis actually tries to stage a little bit of mystery as to what the hell is going on. As radar stations and airplanes are destroyed with their crews vanishing into thin air, it gives the show a little bit of tension. When they bring in William Hopper's know-it-all paleontologist the show ramps up the cheese as he makes wild scientific deductions with little to no evidence to back up his claims. All of this material made for one of the best MST3k episodes of the Sci-fi Channel years. Episode S8E04 is a laugh a minute as Mike accidentally helps the inept Dr. Bobo and the Planet of the Apes set off the Nuke Cult's warhead while slinging some of the best jokes of the entire series. What I loved about this season was how it took on the best of the worst of the Universal International releases and gave them some good-natured ribbing. There are some obvious faults in these flicks and no laugh is ever wasted. From the tedious map opening to the final bug fight, there are some great quotes to pull. "It must've fallen off the body someplace" - "Maybe it's mine, I don't know!" While the quality of the Universal International releases notably dwindled as the 50s edged to a close, their entertainment value endures. 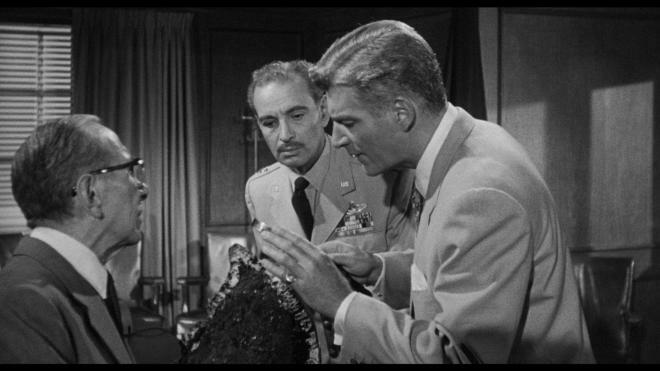 The Deadly Mantis is a far cry from This Island Earth, but it's a fun flick as it tries to ape the Godzilla playbook. The acting is cheesy, the science isn't all that scientific, the characters are paper cutouts - but that damn Mantis is a delight! 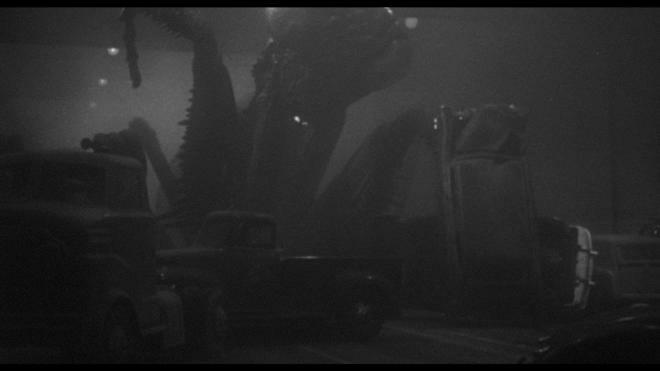 Clearly, the budget was spent bringing that creature to life with a convincing puppet and miniature sets and vehicles for it to destroy! 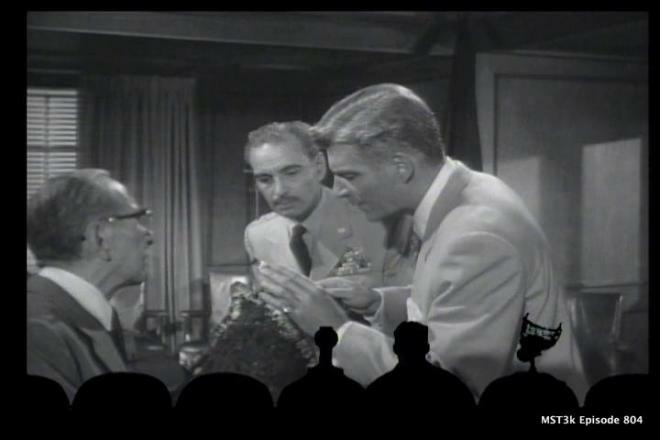 Whether you watch it straight or with the MST3k episode - you're guaranteed top-flight entertainment. 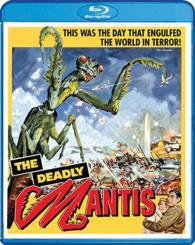 The Deadly Mantis crawls out of the ice onto Blu-ray courtesy of Scream Factory in a single disc set. Pressed on a Region A BD-50 disc, the disc is housed in a standard sturdy Blu-ray case. The disc loads directly to a static image main menu with traditional navigation options. 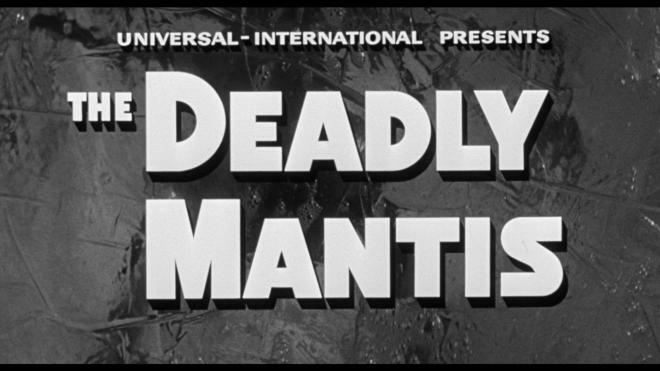 Sporting a new 2K scan of the original film elements, The Deadly Mantis sparkles with an often terrific 1.85:1 1080p transfer! For comparison to their recent release of The Mole People, the source elements here are in great shape with only slight occasional speckling. The only truly troublesome elements are the often frequent stock footage segments that can display any number of anomalies from softness to speckling to scratches and hair - but those are all baked in for flavor! Details are robust allowing facial features, clothing, and set design to come through with crystal clarity. When they're making early investigations into the destruction of a radar station you can very obviously tell the snow was little more than shredded styrofoam! The real delight here is when we get to our close-ups of the titular monster and we can enjoy all the fine creature work on display. 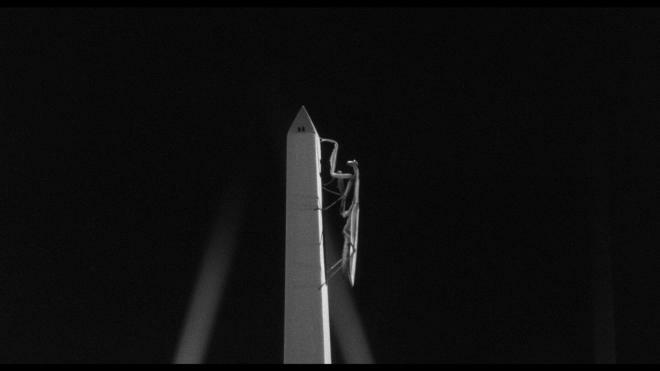 It really is an impressive bug and when it's knocking over busses or when they get a real insect to climb a model of the Washington Monument it looks great. Grain is present throughout but stable without becoming noisy giving the image a pleasant film-like appearance. Grayscale shadows, black levels, and contrast are spot on giving the image plenty of three-dimensional depth. It's a lot of fun switching between this new scan and the included MST3k episode! Now that Scream Factory just announced This Island Earth, Monolith Monsters, and Monster on the Campus on top of the upcoming Tarantula for Blu-ray - some of my favorites are getting the true 1080p treatment they deserve. Not only does it look better than ever, The Deadly Mantis sounds better than ever! One of the best parts of this movie is the sound design of the titular bug. When it's flying it sounds like a swarm of bees. When it's attacking people it's a weird combination of canned monster roars and pig grunts and squeals making it a pretty wild sound effect! The airplane combat bits sound terrific giving plenty of roar to the jet engines and shrieks to their missiles. Dialogue is clean and clear throughout making some of the more impassioned conversations all the funnier. General sound effects come to life nicely, but so much of it is designed to fill in for silent stock footage that it can sound a bit one-dimensional without any atmosphere or space. During the big action bits or the early parts where the army guys are trying to figure things out give plenty of spacial atmospherics to fill the scene. Per usual the library music that was recycled for so many of the Universal International films fills the mix nicely. Free of any notable hiss or breaks, this is another great sounding audio track. Maybe not a laundry list of bonus features, but this selection Scream Factory has assembled brings the goodies. 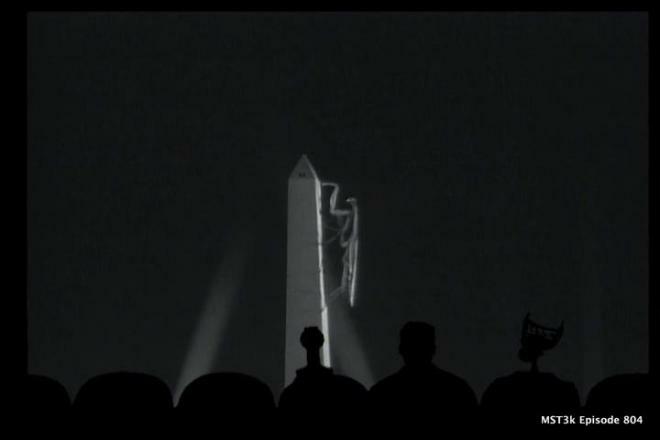 Like The Mole People, the classic MST3k episode is featured here and it a laugh a minute. Also included is another stellar audio commentary from Tom Weaver and David Schecter that gives fans plenty of awesome trivia tidbits about the production and Universal International. MST3k Episode S08E04 (SD 1:32:16) Easily the highlight of the bonus feature package, this is a classic episode with plenty of great riffing! It kicks off strong with "For Every Action" - "There is a Jackson!" The Deadly Mantis is a classic piece of sci-fi B-movie schlock that aimed to capitalize on the giant monster genre - by spending as little money as possible! Chock full of stock footage, you haven't seen anything until you've seen a Praying Mantis attack a tribe of stock footage Eskimos! 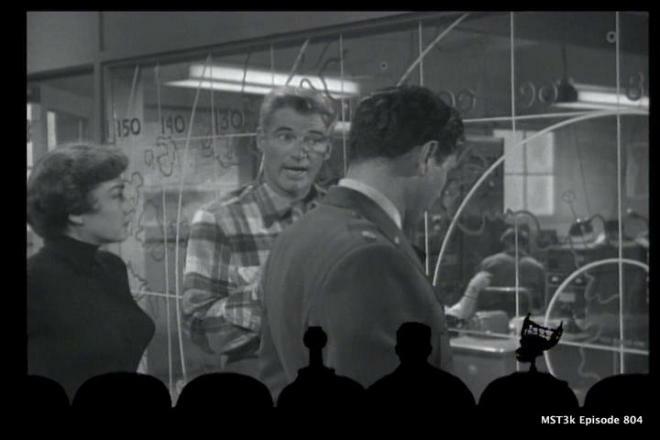 Toss in the hilarious MST3k episode and you've got a movie experience you can't pass up! Scream Factory continues the great work they started with The Mole People by bringing a truly worthwhile Blu-ray to market. Featuring a terrific A/V presentation and a bunch of great bonus features, this is a disc that's easy to call Recommended.